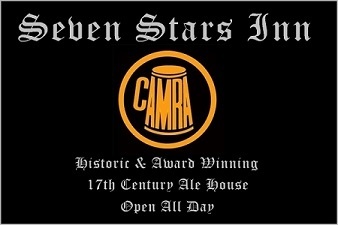 The Seven Stars is home to the longest running monthly beer festival in Europe. Called the “Beeriodical” it takes place on the 1st Monday of each month and typically lasts for 4 days. Every month we offer 20 different cask ales from small independent breweries. Each of these festivals focuses on a different county, region or area from the UK. Come join us and let our “Beeriodical” give you the chance to taste and savour some great beers from our great country. NEXT FESTIVAL: 20 Cask Ales from SHROPSHIRE. Racked, tapped, settled and served from Monday 3rd December.